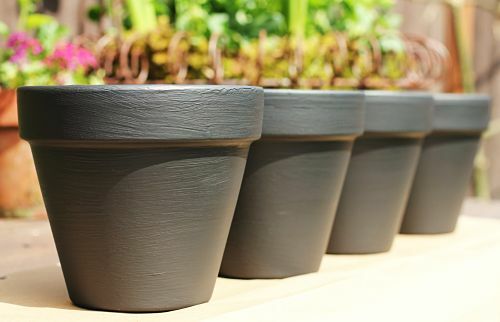 If you’re trying to come up with a craft project for your kids to make for Teacher Appreciation Day next week, these chalkboard painted pots should do the trick. Not only are chalkboard painted pots easy to make, but your kids will love making them for their favorite teacher as well. Plus, the teacher will be THRILLED it’s not an another apple. Ha! Personally I think these pots look great outside sitting on a potting bench. If you would like to give them as indoor gifts, I would suggest purchasing little terra cotta saucers to place underneath the pots to allow for drainage. I’ve tried several different brands of chalkboard paint over the years and Rust-Oleum Chalkboard Brush-On is my favorite. You might be able to find it in your local hardware store, but if not, Amazon has it too. Another great thing to have on hand are Chalk Ink Markers. Amazon has these, but you can probably find them for less at the craft store with a coupon. What is the size of the pots you used for these?